Not just a player but also an inventor, Luca Stricagnoli has been astonishing local audiences with his superlative technique and innovative instruments. Inventing a triple-neck guitar, using a table knife as a drumstick, drawing a violin bow across the strings, playing up to five guitars in one piece and plucking with his foot. All these ideas were employed by acoustic guitarist Luca Stricagnoli when he wowed local audiences during a two-hour concert at Shanghai’s Huangpu Theater last week. “The guitar is my way of expressing myself, just like my mouth and my vocal chords,” Stricagnoli says. Born and raised in Italy, the 27-year-old started to play classical guitar at 10 years old but quit when he was 16 to take up judo. “I didn’t lay a finger on a guitar for three years,” he says. 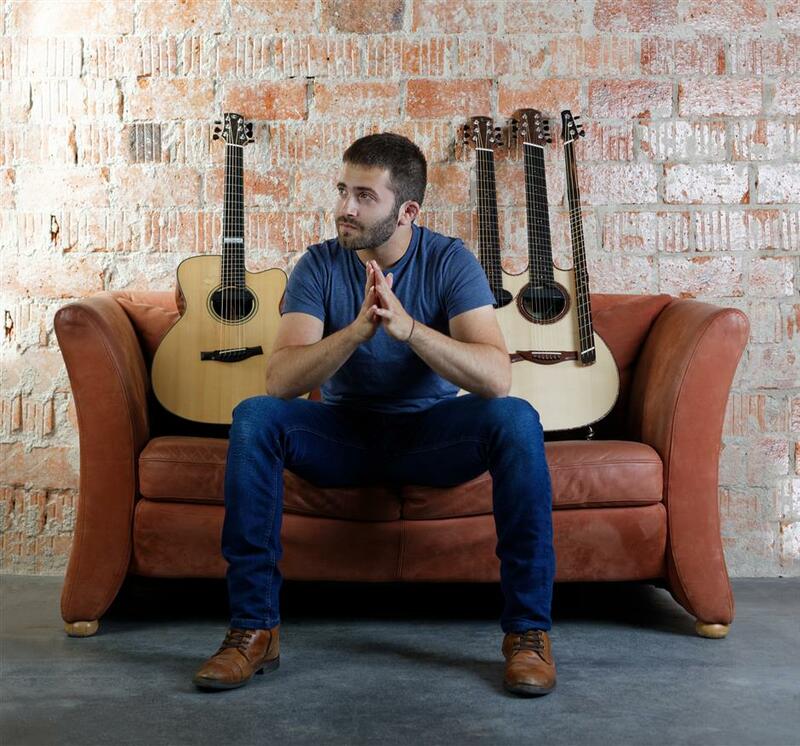 A video featuring American guitarist Andy McKee’s performance of “Drifting” rekindled his passion and his dream of becoming a professional guitarist. “The sensation of awe that I felt at that moment is something I will never forget. I knew that the dream was still alive,” he says. His unique style quickly gained him a lot of fans, with his videos receiving more than 100 million views on YouTube and Facebook since they were uploaded about four years ago. At his Shanghai concert, there were gasps when he introduced his invention – a reversed triple-neck guitar handmade by Italian luthier Davide Serracini. The instrument is comprised of a standard guitar neck, a soprano guitar neck with seven high-pitched strings and a bass neck with three low-pitched strings. With only one guitar, Stricagnoli can create an entire band. He also invented a soprano guitar specifically for the piece “Sweet Child O’ Mine,” the arrangement of which took him six months and was played in Shanghai on two guitars at the same time. “The piece features one of the most elaborate tunings I have ever used. I was scared of playing it live, but I kept trying it though often messed it up. For me, it represents a victory over fear,” he says. 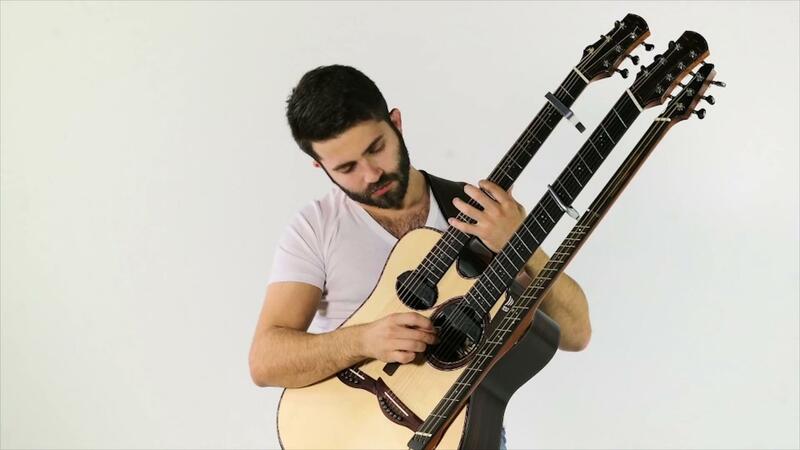 Italian Laca Stricagnoli has invented a triple-neck guitar (right) with which he can create an entire band. “When I fail to obtain the results that I want in my compositions and arrangement, I get moody,” he admits. However, performances force him to show his best possible self in front of audiences and thus he has to be a “showman” hiding negative emotions and recharging himself with positive energy. He composed “Showman” along with “Round Thing” about his love for Pfeiffer and “Somewhere” about the loss of his grandmother. “My inspiration comes from my life and from the life of others, from emotions I feel and the emotions I imagine other people may feel,” he explains. In Shanghai, Stricagnoli played selections from his latest album “What If.” For him, the record symbolizes curiosity toward new ideas and the courage to abandon his comfort zone. During his concert, he closed his eyes or focused on his fingers and strings, fully immersing himself in the music. But at the end of the show when he shared the stage with Pfeiffer he only had eyes for her.